If Rey and Kylo Ren had grown up together, would they have joined forces for an epic game of dodgeball? Would Poe have been a hotshot video gamer teaching a hapless Finn the basics of virtual space battles? These are some of the questions running through the mind of Jeffrey Brown, the author and illustrator behind the forthcoming Rey and Pals. Told in the style of his bestselling series Darth Vader and Son and Vader’s Little Princess, the new book will feature pint-sized versions of Rey, Kylo Ren, Finn, Poe Dameron, Rose Tico, and other characters from the sequel trilogy and the hilarious hijinks that ensue in some very relatable situations. Today, Brown answers a few questions about his creative process and reveals some charming new sketches from the forthcoming book. StarWars.com: Fans were first introduced to your imaginative style with the Darth Vader and Son series. When you’re taking characters fans already know and love and restyling them as children, what do you define as the essential details and pieces to make sure that, for example, Rey still looks and feels like Rey? How do you capture the personality and costume details so the kid version is immediately recognizable? Jeffrey Brown: The first step is to simplify, and boil the look of the character down to a few elements. Some of the costumes have a lot of detail, but if I draw too much detail in a costume, it doesn’t gel with the cartoony look of the characters’ faces — especially when I’m drawing Rey as a little kid. The other thing to focus on is body language and expressions. Rey is someone who dives right in, and can be very decisive and isn’t afraid to try and fail. So when I’m drawing her I’m imagining when kids are like that, trying to capture that feeling with how she stands or walks or gets into mischief. It also comes with time. I have to live with the characters quite a bit, watching the movies over and over while drawing and sketching them, so by the time I’m creating the final artwork, they’ve developed their own look and feel. StarWars.com: Tell us a little about your process for writing one of these books, marrying some real-world scenarios children encounter everyday with Star Wars references and characters. What inspires the situations that you end up including in your stories? 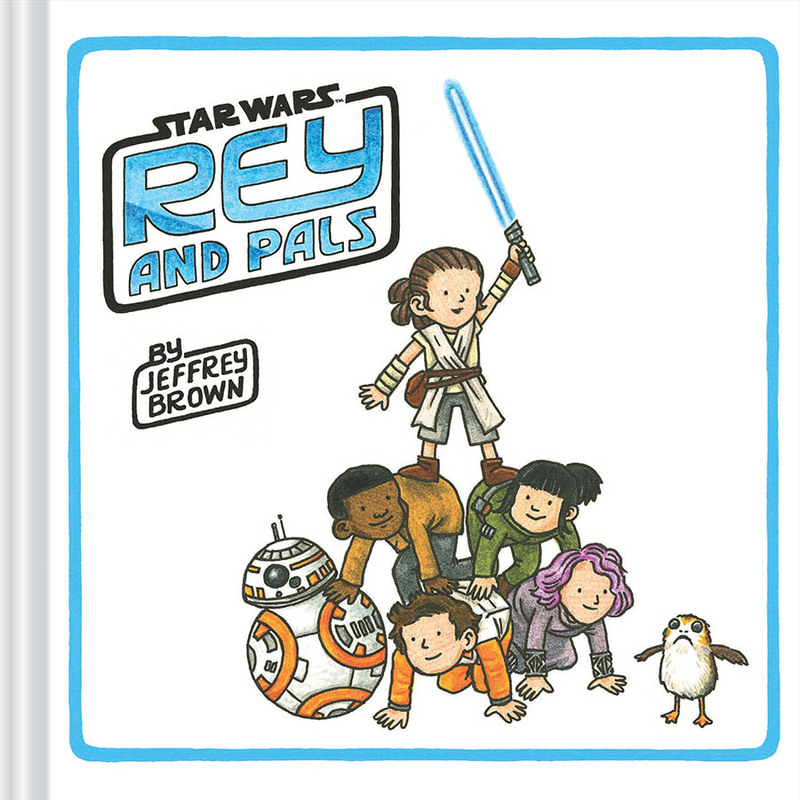 Jeffrey Brown: It’s always a mix of starting with a character or scene I want to draw — or both, in the case of a giant spread set in Maz’s castle — or thinking of a real-life situation and finding the right Star Wars moment to filter that through. For example, I grew up playing role-playing games, and my older son has started playing them with friends now, so I came up with some of the characters playing something like Dungeons & Krayt Dragons. Overall, the process starts with coming up with a ton of ideas — almost 200 for this book! Some are clear from the start, some get re-worked and recycled, left for later. And some I know aren’t likely to make the cut, because they’re too dark or don’t have the right tone, but I draw them anyway. By the time I’m creating the final art, all the concepts seem obvious and immediate, and sometimes I forget just how much work it was for us (myself and the editors and Chronicle and Lucasfilm) to craft the ideas. StarWars.com: Can you give us a sneak peek of your work on the book? Jeffrey Brown: Yes, and you don’t even need Bothan spies to share! 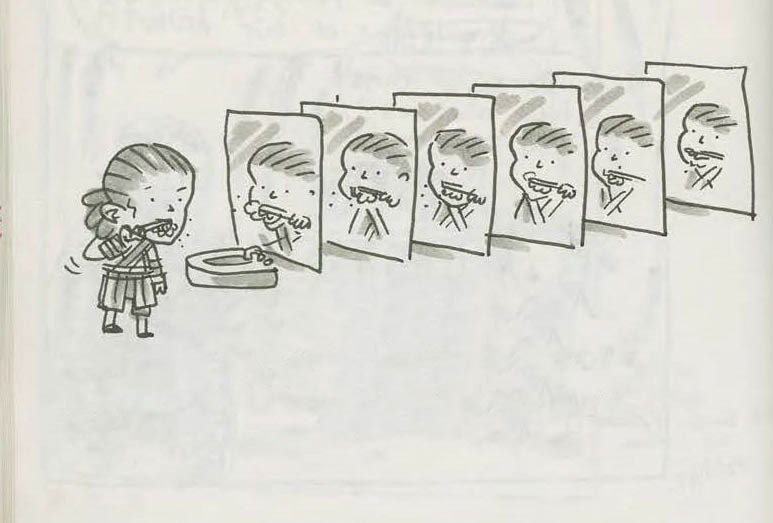 The mirror sketch was one of my first handful ideas. I was telling my older son to brush his teeth way back when I drew Vader’s Little Princess, and now I’m always telling my younger son. I think if you’re a kid it must seem like the scene on Ahch-to, you’re always having to brush your teeth over and over! 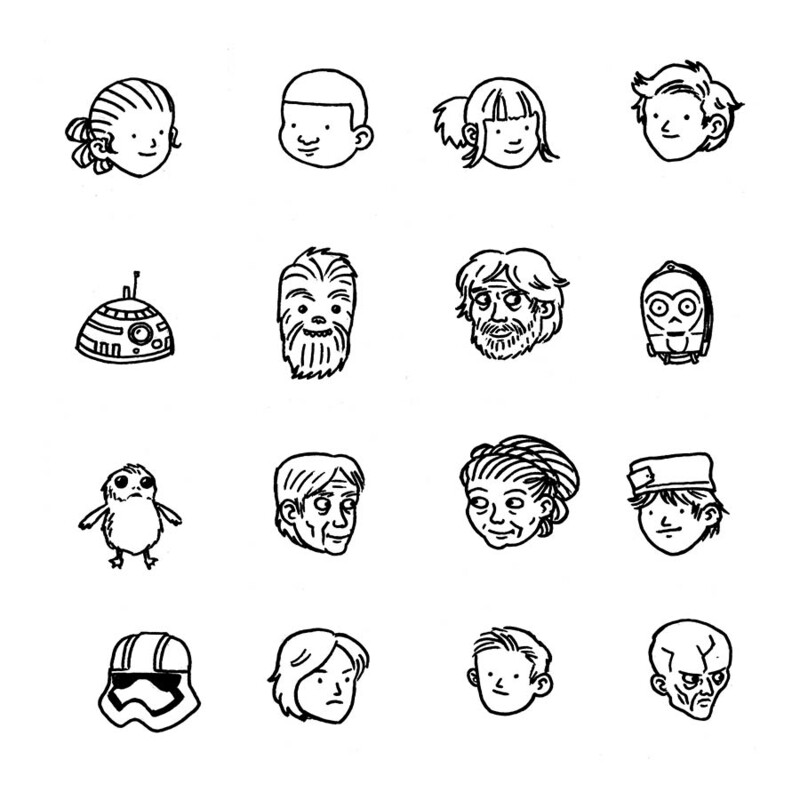 These character heads are for the end sheets. It was a fun solution for the first book, but even more fun this time with so many more characters to choose from.